Design wise, the Les Paul was never the most ergonomic guitar on the planet, and this Epiphone model is no exception. 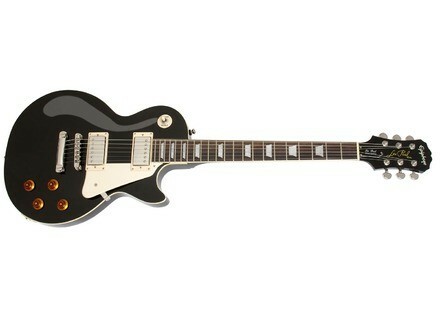 The Epiphone model, like the 2008 model Gibson LP Standard, features chambered construction so it's lighter than your average LP, but as I stated in my LP Standard review, the cost of a lighter wait is a thinner/un LP like tone in my opinion. The upper fret access on Les Pauls is decent enough, though the neck heel can get in the way on occasion. Getting a decent tone out of this guitar is not difficult. Like nearly every Epiphone guitar I've tried, it's plagued with muddy, cheap sounding pickups that lack note definition, so the tones as stock are not even close to my Gibson LP that is loaded with '57 Classics. However, I have tried models that have had replaced pickups, and it does greatly improve the tone of the guitar plugged in. The clean tones are fair enough when set up correctly. The pickups lack a lot of the punch of some higher quality models from Gibson, DiMarzio or Seymour Duncan, but even considering that, the cleans have a decent low end and midrange tone that's excellent for jazzy and bluesy tones. The overdrive tones are nice for the guitar for sure. It seems to excel at seventies/eighties arena type hard rock. The guitar isn't quite as dynamic as my Gibson LP, so using the volume and tone controls really don't do quite as much as I might like. All in all I figure the Epiphone Les Paul Standard is a decent lower budget guitar for someone who really wants to be the next Jimmy Page or Slash, but is on a budget. The construction of the guitar is fine and it plays fairly well... but the electronics are simply just not up to par. Personally, if I was spending $600 on a flamed top Epiphone LP Standard and then an additional $150 or $200 on pickups/electronics... I would simply put my money into a second hand Gibson Les Paul Studio or Studio Faded, which to me is a far superior instrument and will hold its value far better than an Epiphone.